Yellow Split Moong Dal Poha Dosa is a quick and instant Dosas you can make for your breakfast or for any meal. When it came to Y, I didn’t have any idea on what to do and I simply settled on making Yellow Moong Dal. While I already have different versions of Yellow Moong Dal dosa, I wanted to make sure I have a new recipe to try. This time I added poha and wanted to see how different it tastes. You will have to make sure you use a well seasoned tawa to get crispy dosas. I made this for a breakfast and it was such an easy dish to assemble quickly for your breakfasts. Yellow Moong Dal Poha dosa is my choice for Y in the AtoZ Flabread and More, where I am doing AtoZ Dosa Varieties. As I have always felt, the month has almost vanished with us being so focused on cooking and blogging every day that we have reached the penultimate day without even knowing! 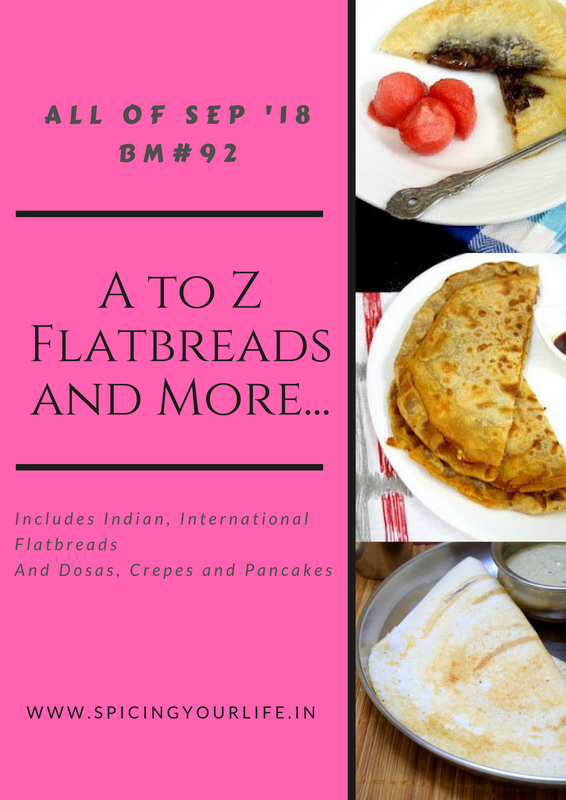 If you are keen to know what’s Y in AtoZ Indian Flatbread, hop over and check! Wash and soak the moong dal for 30 mins. Just before griding, soak the poha and drain right away. Take the moong dal, poha along with salt and green chilies. Adding very little water, grind to a smooth paste. Heat a nonstick tawa and pour a ladleful of this batter. Spread well. Cook on low flame with a lid covered. Cook on both sides and remove when done. Serve with sambar, or chutney. Such a crispy moongdal dosa na, adding poha and rice flour sounds awesome and definitely an interesting addition. I can have two more yellow moongdal dosa with some spicy chutneys for my dinner tonite. Love this near instant dosa….looks so crispy and inviting. I could have this for breakfast and dinner. Yum yum! That is a new combination for pesarattu, Valli. Moong dal and poha is definitely a new combination for me. I could have made this today as I made pesarattu for breakfast. Next time for sure. I make yellow daal Dosa or cheela as we call them , adding poha is completely new . I bet this must be making he Dosa soft . Great pick , I guess Yellow is the star word of the day . Very healthy and delicious dosa recipe.. will def make it next month for breakfast.. Book mark. I often make yellow moong dal chila but have not tried it with the poha added to it. A simple and easy to make comfort food. This use to be our sunday special snack when we were kids. Your version of adding poha is different. Will surely try adding next time. great dosa recipe using lentil and poha. dosa looks delicious. bookmarking will try it soon. Same pinch ! I too used yellow moong for the days post! I have made pasi paruppu dosai but never add poha. Such a nice variation! Healthy protein filled dosai and the poha must have added some starch to it to make it easy to roll. This is a great recipe.